Thu., Dec. 13: UAB coach Bill Clark has truly made something out of nothing. It’s a football comeback story that defies the expectations of even the most ardent of Blazers fans. And on Thursday, the 50-year-old Clark was named the 2018 Eddie Robinson Coach of the Year recipient by the Football Writers Association of America and the Allstate Sugar Bowl. 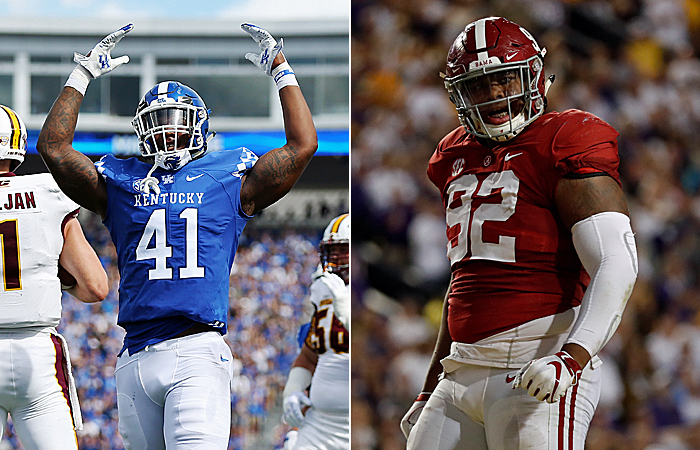 Josh Allen and Quinnen Williams are among 15 SEC players honored by the FWAA as All-Americans. Mon., Dec. 10: The 2018 Football Writers Association of America All-America Team was announced Monday, headlined by eight players from the Southeastern Conference and six from the Atlantic Coast Conference along with Heisman Trophy-winning quarterback Kyler Murray of Oklahoma. Nine of the 10 Football Bowl Subdivision conferences plus two independents are represented on the first and second teams that also include seven repeat All-Americans.